Trump solves one Cabinet problem. Now he faces another. WASHINGTON — Just after one Cabinet nominee — Mike Pompeo — cleared an important hurdle in his bid to be secretary of state, another one — Ronny Jackson — looks to be in trouble to be President Trump’s next VA secretary. As we wrote last week, Trump trying to replace ousted cabinet members — remember Rex Tillerson and David Shulkin? — has been A LOT harder than the president probably ever anticipated. And it’s even harder when there’s little to no vetting going on. 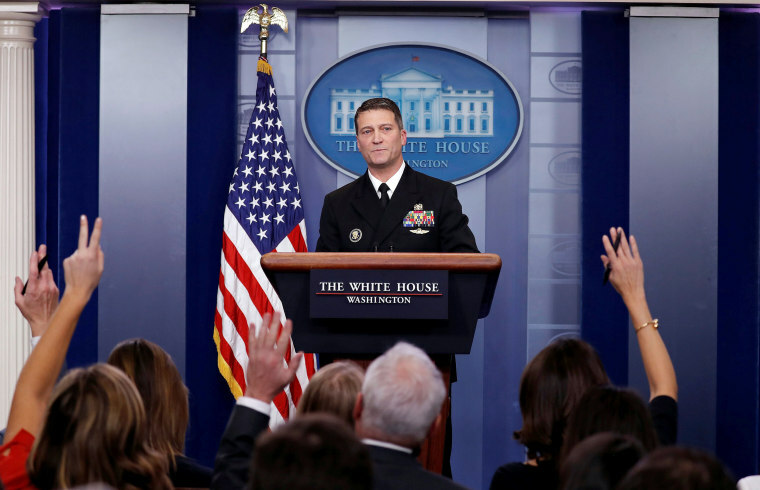 “There was no vetting on Ronny Jackson. No formal interview. No process. Now his nomination will be held up amid a probe into his behavior,” the Washington Post’s Josh Dawsey tweeted last night. If the White House isn’t vetting its picks for Cabinet secretary, what else isn’t being vetted? The good cabinet news for the Trump administration yesterday was that Pompeo won approval from the Senate Foreign Relations Committee, thanks to a reversal from Sen. Rand Paul, R-Ky. But on the menu for tonight’s state dinner honoring French President Macron: a rack of lamb, jambalaya, nectarine tart. By the way, Trump and Macron hold a joint news conference at 11:45 am ET. Today is the special election in AZ-8, where Republican Debbie Lesko faces off against Democrat Hiral Tipirneni in a district that President Trump won by 21 points in 2016. The polls close at 10:00 pm ET. As we wrote yesterday, a substantial part of the vote is already in, and that vote is disproportionately older and more Republican. But keep an eye on the margin – in the eight major contests of 2017/2018, Democrats have outperformed Hillary Clinton’s margins in these states/districts by, on average, about 12 points. Will that pattern hold in Arizona? Californians dreaming — about 2020? And, of course, there’s Sen. Kamala Harris, D-Calif.